If you’re a bank, particularly a bailed out tax payer owned bank, who’s about to pay out £7 billion or so in bonuses (which is the equivalent of £113 for every man, woman and child in the UK), while everyone else in the country is going through austerity and slowly being made redundant, then you have a seriously hard sell on your hands if you don’t want to be lynched. Before announcing the bonuses you need to get your PR machine into gear and show the general public that you’re not immoral or greedy but instead a warm and loveable organisation who cares about the general public and wants to help society as a whole. And so it started today with the Financial Times reporting that “Banks consider £1.5bn in ‘Big Society’ fund contributions”. This fund is being considered by Barclays, HSBC, Lloyds, RBS and Santander. This money is apparently going to fund community projects over a 2 year period. So if you need your schools fence painting or think you can save the dodo from extinction then apply directly to the banks and I’m sure you’ll be successful. Will this pacify the masses? I’d say unlikely. So enough rambling. Today it’s the S&P 500 PE10 (or S&P 500 CAPE) that I’m interested in. As regular readers know I am using this ratio to try and squeeze some extra performance out of my portfolio. This method is used by Professor Robert Shiller however I modify it slightly by incorporating forecast earnings up to the month of interest. For new readers some background information on the CAPE is available here and if you’d like some information on why I use the CAPE then that is available here. As always my 1st chart plots the Shiller S&P 500 PE10 that now sits at 21.7 which is up from 21.2 in October. My mechanical investment strategy forces me to take action no matter what. With the increase in this PE10 my UK Equities target asset allocation decreases to 17.2% (nominal based on buy & hold would be 21%) and my International Equities target asset allocation decreases to 12.6% (nominal based on buy & hold would be 15%). 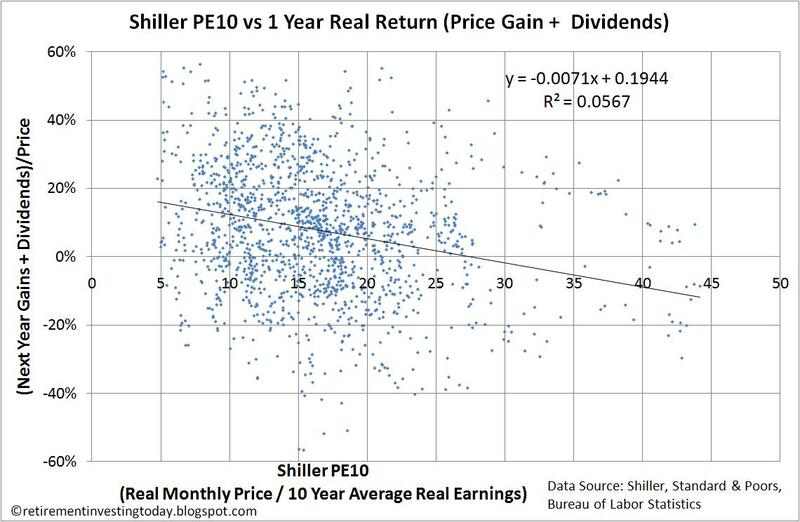 The Shiller S&P 500 PE10 Average stays at 16.4. Assuming this can be considered “fair value” with a PE10 of 21.7 we are now over valued by 32%. 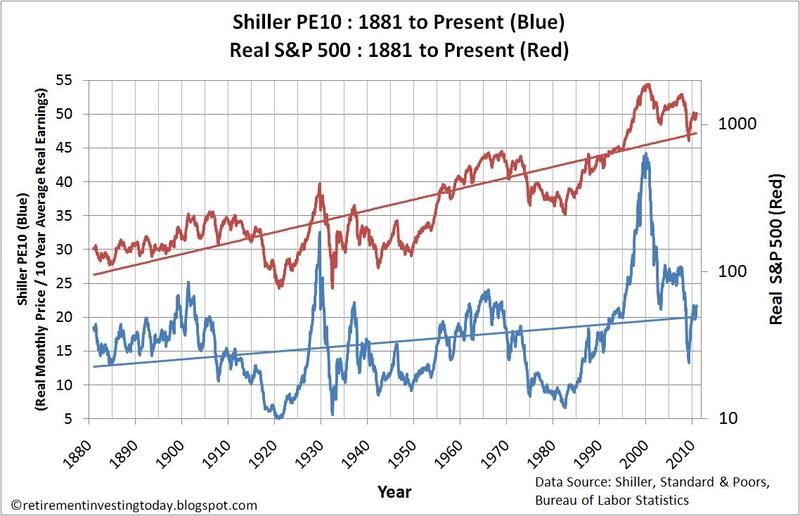 The reason why I use the Shiller S&P 500 PE10 is shown in my 2nd chart. The correlation with the Real (ie after inflation) S&P 500 Price is currently 0.78. 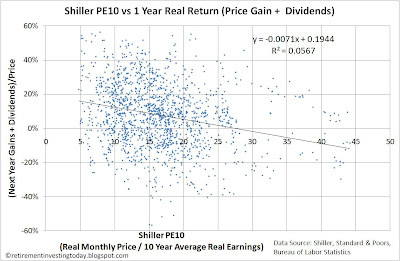 This can also be seen on the chart, which while the R^2 is low, there appears to be a trend, particularly as the PE10’s get large (ie very over valued). - Prices are month averages except November ‘10 which is the 24 November ’10 S&P 500 stock market closing price. - July ’10 to November ’10 reported earnings are estimates from Standard & Poors. 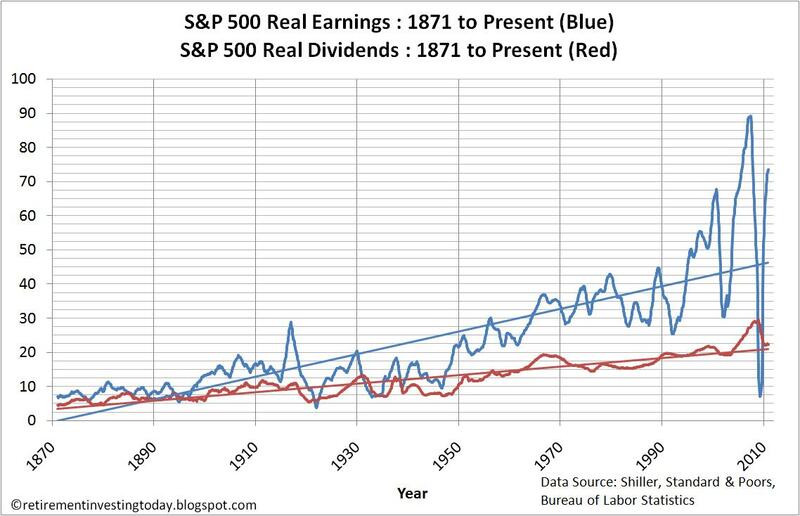 S&P has December 2010 annual earnings estimated at $74.23. - Inflation data from the Bureau of Labor Statistics. November ‘10 inflation is extrapolated. 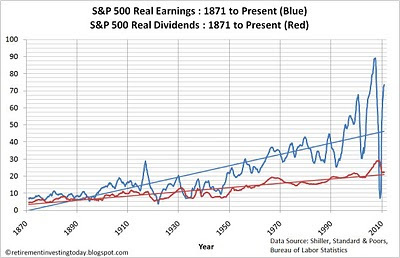 - October and November ‘10 dividends are estimated as the September ‘10 dividend. I have a proposal for discussion. As I understand your methodology for tactical asset allocation, when equities are somewhat expensive (as now) you underweight them. Perfectly sensible. But then that money gets moved into bonds I think. Now just suppose that bonds were significantly overpriced (something that shouldn't be too hard to imagine at the moment). In that case you could be moving money from an asset class that was slightly overpriced to one that was significantly overpriced. My proposal then, is to assess whether bonds are overpriced & consider that in the asset allocation decision. This assumes an objective way of assessing the value in bonds. However I for one know of no such measure - apart from comparing them to TIPS which is no use for this purpose. I actually move the money into cash rather than bonds for exactly the reason you mention. It means should the market fall then I can quickly move into equities without any risk as to bonds being high or low in price. I don't run any sort of valuation models for my 'bonds' allocation as my definition of bonds is a little loose. The vast majority of my 'bonds' holding, 89%, is actually NS&I Index Linked Savings Certificates (ILSC's) with the remainder in Index Linked Gilts and Corporate Bonds. ILSC's can be neither over or under valued. I guess they are mostly like cash except they keep pace with inflation and you don't pay tax on them. My holding of other bonds is small enough that I just run strategic allocations as my knowledge of the bond market is low and like yourself I also have no idea how to assess value. - My company pension scheme is a rip off charging me fees of 1% on all asset classes. This is where I'm holding the Gilts and Corporate bonds meaning I'm probably making nothing in real (inflation adjusted) terms. - I could buy in my S&S ISA however as I'm saving so much money per month I think I'm most tax effectively investing by filling the ISA with gold, equities and property and buying the ILSC's outside of the ISA which pay returns tax free. - For example my ILSC's which have been bought over a number of issues are giving me an effective return of 9.2% before tax (I'm a 40% tax payer). I can't see me long term getting anywhere near that with bonds outside of tax shelters. - I'm filling my ISA's to the maximum. The only option would be to put more money in my pension, which is cuurently 36% of my wealth. I'm not willing to do this as you have the risk of government legislation changes, I don't own a house which one day when they are sensibly priced I will need money to buy one with and finally I will be, with a fair wind, 'retiring' in my early 40's from which I have to fund myself until I can access my pension. Lots of rambling there. Hopefully I've answered your question. For me though, your answer doesn't work so I am doomed to ponder the valuation of bonds for a bit longer.